get lightly used books, like the ones her grandchildren owned but would not keep forever, into the hands of children who had few or no books of their own. She assembled a small advisory board and began collecting books through a few area schools. 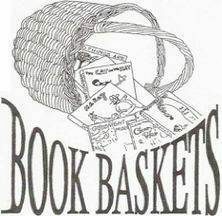 Book Baskets was incorporated in 1996 and applied for non-profit status. It is a 501(c)(3) non-profit organization committed to making gifts of new and lightly used books to children in the Charlottesville and Albemarle County area who do not have books of their own. A small bookplate is placed in the front of each book that allows the recipient to identify the book as his or her own, thereby emphasizing book ownership. Today, Book Baskets has 11 board members and collects books from 19 area schools. We distribute books through over 30 local social service agencies and education programs and are always interested in expanding our program to new organizations in the city of Charlottesville or Albemarle County. Over the past several years, we have consistently donated more than 20,000 books per year to children in our community. Our overhead is only 4%. Our volunteers collect lightly used children’s books from wicker baskets placed in 19 area public and private schools. Parents, students, and staff fill these baskets throughout the school year. Books are also donated by groups interested in running a book drive for Book Baskets. In recent years, we have received books collected via book drives conducted by Zion Union Baptist Church in Charlottesville, the APO Service Fraternity at UVA, Leadership Classes (with help from the National English Honor Society) at Western Albemarle High School (article here), and Park Street Christian Preschool. We use monetary donations to pay for shipping of books from the First Book National Book Bank and to buy books from the First Book Marketplace, Scholastic Literacy Partnerships, Scholastic Book Clubs, and other wholesalers or special promotions. We have a particularly close relationship with First Book, a national non-profit, from whom we have received over 55,000 books since 2010. In addition, Book Baskets has received grants from First Book, the Bama Works Fund of the Dave Matthews Band in the Charlottesville Area Community Foundation (CACF), the Community Endowment Fund of the CACF, the Dollar General Literacy Foundation, and the Tzedakah Fund of Congregation Beth Israel, among others.